Hello, CarbonWA friends: A new carbon tax bill has dropped in the legislature! 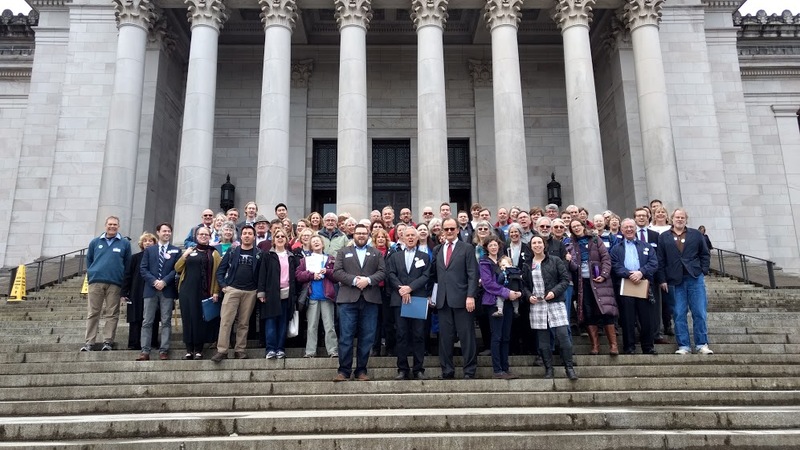 Read on for our analysis, a report out from lobby day, and to meet our new board members. And read what the Seattle Weekly has to say about the prospects for a carbon tax (“Some say it’s just a matter of time”). We’ve been saying for awhile now that the carbon tax discussions were still happening in Olympia, and the freshly dropped SB 5930 shows that the carbon tax is still on the table. We’ve been following the development of this bill closely for the last couple of weeks. The authors of the bill, led by Senator Guy Palumbo, have done an admirable job crafting a bill that is effective at reducing carbon while having a shot at getting some traction in the legislature. So, while you’ll see in our analysis that we think the bill could and should be strengthened, it’s a credible start at a centrist framework that could become a bipartisan compromise. Check out our blog post on SB 5930 to get our take. If you want to see us continuing to advocate for an effective carbon price this session, please consider making a donation towards our April 22nd $2200 goal to help us continue our work. Huge THANK YOU to the over 120 people participating in our ACT NOW lobby day that is happening right now. Our group kickoff off with this photo around noon and our volunteers are in meetings all afternoon. It’s not a coincidence that there are now 4 carbon tax bills in the legislature and one dropped today. This is happening in large part because of our shared work, gathering signatures back in 2015, campaigning, engaging the media, writing letters and lobbying our legislators. If you are reading this on April 20, it’s not too late to call your legislator right now! Ask them to ACT NOW and support a carbon tax to get in on the fun! We are thrilled to be adding Phil Jones, Peter Kelly, and Doug Ray to our board. Phil Jones just completed a 12-year term on the Utilities and Transportation Commission. He has experience working with the conservative side of the aisle and he brings a wealth of experience in the electric sector. Peter Kelly, a major I-732 supporter, is a PhD economist who founded Grow Further, a nonprofit working on sustainable agriculture in the developing world. Doug Ray lives in Eastern Washington and has a background working with Pacific Northwest National Labs (PNNL) in the Tri-Cities. We’ll be announcing additional new board members in the coming weeks.